Bradley-Chaves undercard on 12/13: Andy Lee vs. Matt Korobov & Mauricio Herrera vs. Jose Benavidez Jr.
Top Rank is packaging the December 13th HBO Tim Bradley (31-1, 12 KOs) vs. Diego Chaves (23-2, 19 KOs) with some really interesting boxing action on the undercard as part of this triple-header card. The word is unbeaten #1 WBO Matt Korobov (24-0, 14 KOs) will be facing #3 WBO Andy Lee (33-2, 23 KOs). Also, interim WBA World light welterweight champion Mauricio Herrera (21-4, 7 KOs) will be facing unbeaten Top Rank promoted Jose Benavidez Jr. (21-0, 15 KOs). This will be a big step up in class for the 22-year-old Benavidez Jr, because he’s still facing weak opposition at this point in his career. At 5’11,” it’s hard to know whether Benavidez Jr will ever work out as a welterweight. He’s too thin and he’s someone that will likely get taken apart by the sturdier welterweights like Marcos Maidana and Keith Thurman. Herrera is a tough fight for Benavidez Jr, but obviously Top Rank promoter Bob Arum likes the match-up because he wouldn’t agree to the fight if he didn’t think his guy could win it. The Bradley-Chaves card will be taking place at the Cosmopolitan of Las Vegas, in Las Vegas, Nevada. Korobov and Lee will be fighting for the vacant WBO middleweight title that was recently vacated by Peter Quillin. That’s a decent match-up. Lee has good power, and he’s only been beaten by Brian Vera and Julio Cesar Chavez Jr. Korobov has the power and boxing skills to give Lee problems, but he might not have the stamina. Korobov is a good 4 round fighter, but he tends to fade after 4 rounds, and Lee might be able to get a decision against him if he doesn’t fall apart like he did against Chavez Jr and Vera. “The Bradley-Chaves and the Benavidez-Herrera fights, those are done. For the Korobov-Lee fight, the fighters have agreed, and we’re tyring to close that match with HBO. We’re trying to finalize all of that with HBO,” said Arum via RingTV.com. “That would be one of the best cards of the year. Bradley and Diego Chavez, Benavides really stepping up with Oscar’s fighter, Mauricio Herrera, and, finally, Andy Lee against Korobov for the middleweight title. That’s a helluva card,” Arum said. This would be a better card than most of Manny Pacquiao’s recent fight cards, because those cards have been disappointing to say the least. Even the main events have been disappointing. 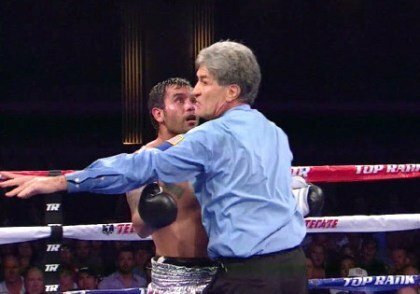 You are here: Home / Boxing News / Bradley-Chaves undercard on 12/13: Andy Lee vs. Matt Korobov & Mauricio Herrera vs. Jose Benavidez Jr.